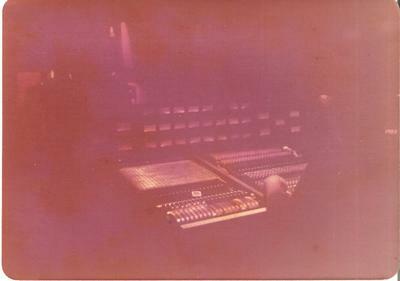 Criteria Studio C console. 1976. Was a 14 year old bass player in Bed Sty, a punk band. Tracked 5 songs over 2 days. Studio was Locked Out by the Bee Gee's at the time. Our manager Chuck Compton arranged with Mac to "sneak" us in between 11 am and 5 pm. Had to move and exactly put back all the Bee Gees gear in place when we were done. This was the very beginning of my never ending audio journey. That was such a great little room. It was said that Bowie liked it in particular although I don't know which record he worked on at Criteria. Join in and write your own page! It's easy to do. How? Simply click here to return to MCI - Criteria Studio C Recording Console.